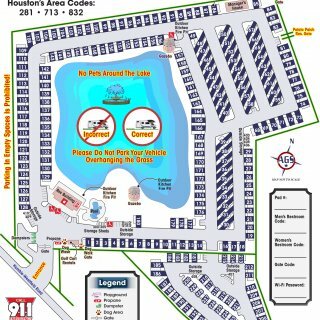 Ask fellow campers about "Northlake RV Resort" and nearby attractions. Love this place and that it's walking distance to the Potatoe Patch. Helpful and friendly park managers. Rating is down from perfect as the grounds keepers are VERY NOISY and takes them hours and hours to get grass etc. The train whistles at 4am I could also do without. Other than that...this park is beautiful, clean, spacious and friendly. We camped at Northlake RV Resort in a Motorhome. They seem to be a very nice park in Houston. We were here for a wedding. The only glitch is that they did not put our code in the gate the first day. Otherwise it is very nice and has great water, power and sites. All concrete and pretty level. We camped at Northlake RV Resort in a Motorhome. Stayed here two nights while in Houston on business. Arrived after office hours, but the security guy was there and opened the gate for us. Our data package was on the door; security brought it to us and directed us to our site, so I didn't even have to get out of the MH to check in. Went to the office the next morning and paid for another day. Everything worked great. Very good hookup locations, just a few feet from the MH site so I didn't have to unroll all my electric cord or water hose. Everything was very clean and well-maintained. Sites are all concrete and level. It's a bit pricey, but that's what I expect in Houston. Some reviewers have complained about train noise. I heard the train, but it doesn't bother me. I have to make another visit to Houston in the near future, and will stay here again. We camped at Northlake RV Resort in a Motorhome. We have stayed here several times while visiting our daughter. The location is perfect for us. The keep the park very clean and there is a a dog 'run' in back corner of park. If your staying more than two weeks you might want to ask about a monthly rate. You want to do it first so if you decide to go that route they can check your electric meter. Gated entrance but there seems to be people going in and out all the time. Nice big clubhouse and they do offer activities or cookouts. Nice pool. We camped at Northlake RV Resort in a Motorhome. I had been at Northlake for quite some time as a full timer and the first 6 mo's were good, however several family's moved in that were related and had multiple RV's and the "resort" became a "trash park". Family fights with loud cursing, cigarette butts everywhere, trash all over the pads, loud trucks constantly at night, parking 4+ vehicles in a pad blocking the pads of others, speeding thru the park, police called for domestic violence, boys peeking over mens shower stalls at other residents etc. Management seemed to just stick their head in the sand that most of the above was due to the family group of "trash". Full timers were baffled and upset that they were allowed to stay and disrupt the resort. After complaining to mgmt. with no change to the situation, I had no choice but to move. Sad that mgmt. prefers to keep "trash" over full time residents that follow the rules. When I was leaving I was asked by several people why I was leaving and I advised it was due to the "trash" that was in the park and they said they agreed and a lot of people were moving out due to management not doing anything about it. Shame on you Northlake!!!! If you stay for a few days it will most likely be a pleasant experience, but if you live there full time, you will see how rules are not enforced by management. I hope this changes for Northlake as I said "was" a nice, quiet place at one time. Not sure about others, but my water pressure wasn't all that great! We camped at Northlake RV Resort in a Fifth Wheel. I would rate this RV Resort as the nicest we have stayed in. We stayed at North Lake RV Resort for 3 nights. Friendly and helpful staff. The roads are wide and all concrete. All site pads are concrete with individual patios and picnic tables. Excellent power and utility location. Nice neat and clean grills and fire pits near the Lake. We enjoyed the heated pool and hot tub. The laundry room is open 24 hrs. ( a plus for us). We plan to stay here again. We camped at Northlake RV Resort in a Motorhome. Perfect place to stay if you have business in Houston. Extremely easy to get to and leave without having to drive through downtown Houston traffic--something to be avoided if at all possible! The facility is clean, quiet, secure, well-maintained, quite lovely. Amenities are extremely nice. Coffee and popcorn are even available in the recreation room! We stayed in a pull-through lot and it was more than ample. The staff are exceptionally nice, very helpful with local directions that were much better than our GPS' suggestions. Loved being able to walk to The Potatoe Patch restaurant. This is definitely our preferred place to stay when in Houston on business. We camped at Northlake RV Resort in a Motorhome. Make time to eat at The Potatoe Patch! Literally walk there through the back gate. That place is an experience not to be missed! We got a late start, so I decided to call before our expected arrival. Boy, am I glad I did. The office closes at 4:00pm on Sunday. The office emailed me a temporary gate code and my packet was taped to the office door. The roads and sites are concrete. Sites are level. Small patches of grass between each site. Sewer connection too close to the ground. It's in a bad neighborhood in Houston, but come on, it's Houston, so the gate's appreciated. Very quiet in the park, but is a noisy metropolitan area as others have stated. We camped at Northlake RV Resort in a Motorhome. Potato Patch restaurant accessible through a coded gate from the RV Park. Open until 9:00pm on Sunday, so nice after our late arrival. It's kinda rare to find a 10 out there, but given the location to Houston and Spring, this is it. Pretty much everything most people have already said is accurate. However we did not experience all the noise people talked about. This was Memorial Day weekend as well. I kinda expected a thunderous speedway, or more plane/airport noise. I guess it could get noisy but I didn't really notice it. We spent most of our time out in Houston and some time in Spring, both are really close. Our evenings were spent in the park, which is taken manicured and cleaned to the point you can go barefooted almost anywhere. We used the pool which has nice feature, starting at 8:00 p.m. adults only. The park is mosquito controlled, which is nice. Houston can have elephant sized mosquitoes. I didn't notice mosquitoes anywhere in the mornings, however as night set in around 9:30-10:00 p.m. came around a got a few bites while sitting outside. Wifi worked well throughout our stay, cable TV has quite a few channels, and all facilities were clean. There is a man-made lake in the middle of the park, I did see a few people fishing, but we did not. There are sites surrounding the lake, I think I'd request one of those if we come back. We got a late site for the weekend and did really get a choice, but it wasn't a problem. We camped at Northlake RV Resort in a Motorhome. The loops into Houston make it easy to get to the city. Nice park in a busy area. Near Willowbrook Orthopedic Hospital and Bush Airport. It can get noisy with the trains and the park does have a fair number of long term guests. The park is clean and the long term guest keep their sites clean and neat. The wifi is among the best we have used. It is well placed for northwest Houston and the I-45 area. Sites are large and easy in and out. We camped at Northlake RV Resort in a Motorhome. The National Museum of Funeral History is near by as is OLD Town Spring. This is one of the best kept secrets in Texas. We loved this park. We stayed here multiple times over the past two years. Between 4 and 8 months at a time. The rate we paid was $450 plus electric for a pull through spot neat the gate that leads to the Potato Patch restaurant. Really nice dog run. The lake, pool, hot tub, gym, BBQ area all are clean and nice. They sell propane right on site. You can even rent golf carts!! We camped at Northlake RV Resort in a Fifth Wheel. Very close to IAH, Bush International Airport. Can jump on I-45 and be downtown in 15 minutes. Planes, trains and automobiles!!!! No kidding, this is the nosiest campground we have ever stayed in. Right next to a highway on one side, and a railroad on the other and most of Houston's air traffic overhead. Sirens! Train horns! Planes! My family Hates the noise. Maybe, like we did, you look at this resort online and think it's in a nice "out of town" lake area. Well, it's a man-made pond with a fountain in the middle, surrounded by concrete RV pads. They created this resort in the middle of an industrial warehouse area and when you drive into the nearby commercial district, it's not a pretty/or safe part of town. This park is tight- close concrete pads- ours just happens to be a giant puddle after the rain, but it doesn't look like anyone else is. The campground only has one bathroom. So if you need or want this, is a bit of a walk. Half the sites are occupied by full-time laborers. Pros: clean and well-maintained, nice laundry room, beautiful little heated pool, close to the city, secure. We will not be staying here again. We camped at Northlake RV Resort in a Fifth Wheel. One of the best RV resorts/parks we have been to! Beautifully landscaped, well maintained, lots of amenities (FREE dog washing center, dog run, recreation room, exercise room, coffee, popcorn, pool, gorgeous stocked pond). The spots are tight but comfortable. Fantastic laundry room with top of the line industrial washers and dryers. The staff are very friendly and accommodating! I'm a sucker for a good sunset, and I wasn't disappointed here! The beautiful orange, coral, yellow, pink sunsets over the lake while swimming with my kiddos in the pool was nothing short of awesome! So grateful we found this place; just wish we found it sooner! We camped at Northlake RV Resort in a Fifth Wheel. This was the second time we stayed at the park. The first time was 6 months and this time was 1 year. It is a very nice park, very clean, and good staff. The reasons I didn't give a 10 was the noise from the trains at night. During the summer a box fan drowned out the noise. This time we had a couple of neighbors that needed lessons in RV etiquette but these were not the park or staffs faults. We would stay again if we work in the area again. We camped at Northlake RV Resort in a Motorhome. Close to any shopping or eating places. Old Town Spring is close a nice little town to shop. Close to airport . Great RV Resort. Staff friendly and helpful. Park very clean. Restrooms and showers are immaculate. Common area are given daily attention. Pads are large and level. Check in and setup is very easy. I was in a travel trailer and would definitely stay here again. 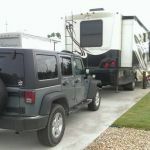 We camped at Northlake RV Resort in a Travel Trailer. 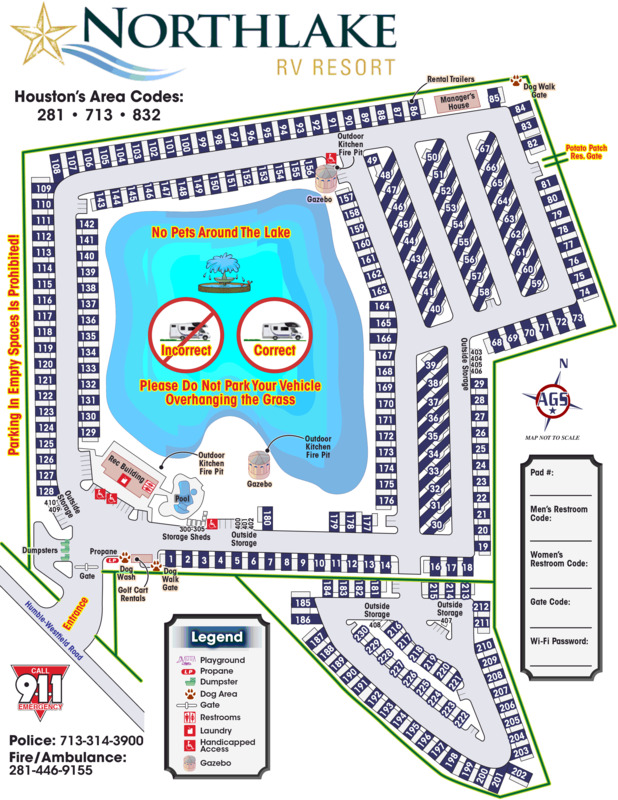 Are you affiliated with Northlake RV Resort ?